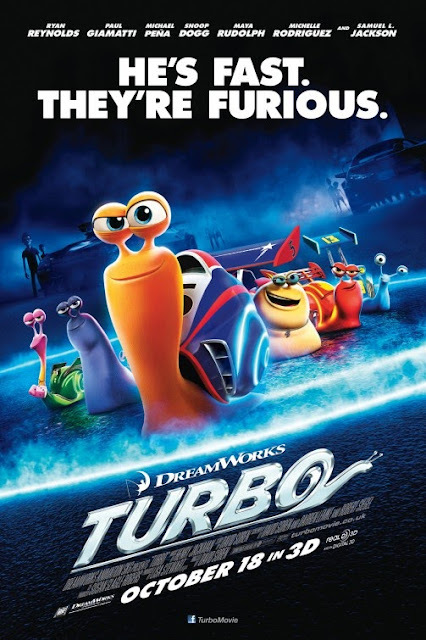 Theo (voiced by Ryan Reynolds), a garden snail, is convinced he is destined to be faster than snails are by nature. He is obsessed with race car driving, and often thinks of himself as a driver, even going as far as painting a #5 on his shell. He is ridiculed by other garden snails as an unrealistic dreamer with no sense of who he really is. After an incident where he attempts to outrun a lawnmower to get a fallen tomato, Theo "runs" away to reflect on his life and ends up looking over the 101 freeway, where he accidentally gets blown off the overpass into the intake of a car in the middle of a drag race. Theo is mixed with nitro fuel and becomes a turbo-charged snail, thus his new name! After returning home, his brother Chet (Paul Giamatti) is snatched up by a crow and Turbo uses his new found powers of speed to save him, winding up in a strip mall that is run down and void of customers. Turbo and Chet meet Tito (Michael Pena), half owner of "Dos Bros" Tacos shop, who believes that Turbo can enter and win the Indy 500. 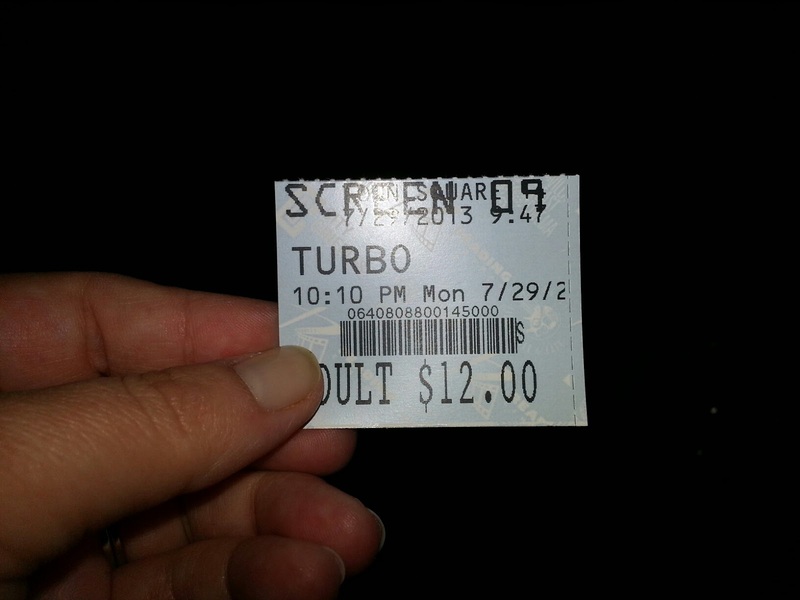 This movie was really cute, and we've learned not to discount movies that are not Disney or Pixar since seeing "Epic." It showcases a much better use of Ryan Reynolds as opposed to "R.I.P.D.," because, for some reason, his comedic style does better when you can't see him acting in real life. There are a lot of funny moments in this film, and the supporting cast of characters including Samuel L. Jackson, Maya Rudolph, Ben Schwartz, Snoop Dogg/Snoop Lion, Ken Jeong (playing a woman, but essentially the same character he always plays), Bill Hader, and Luis Guzman were all really great voice actors throughout the movie. This is definitely a movie kids AND their parents can enjoy. It's a nice underdog story, an inspirational tale that teaches kids to not give up on their dream, no matter how unlikely it is that they can achieve it.